Contemporary cuisine sparked by originality served in a stylish environment. : New Heights’ kitchen has been revamped, now offering an array of small plates, appetizers, and entrées that might include pan-seared wahoo and Shenandoah rack of lamb. Meyer lemon panna cotta and chocolate sponge cake add a sweet touch. Patrons can opt for a casual experience by eating and drinking on the front patio. 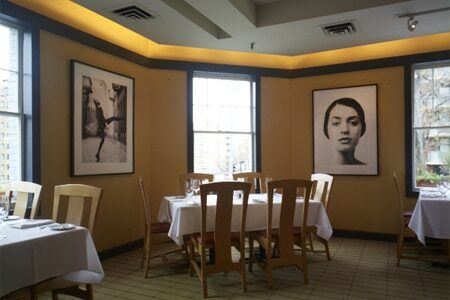 Upstairs, it's very chic: the extensive wine list, the stands of fresh flowers, and the for-sale artwork on its walls make this a sophisticated dining experience for Washingtonians from every age group. Also look out for the restaurant's Gin Joint that specializes in, well, gin cocktails.